Yaasss!!! I’ll be back in time for Countryfile on Sunday! Do you see me now Andreas Kopke? Gareth…I know you have just won a years subscription to “Tailoring Monthly” and you are obviously excited. But…could you just tone it down a bit and concentrate on today’s game! Damn! All that faffing about doing my waistcoat up and I forgot to put my bloody trousers on! Lets all Roar like Lions! Kids, I’ve told you before don’t leave the Lego on the floor. Why did I not do a deal with the waistcoat manufacturers!!!!! Altogether now? “This is the Southgate ovation society”? Gareth suddenly realises the ‘performance enhancer’ he bought off the Russian coach was actually Novichok Aaaaaaaaggghhh!!!!! I A M I N V I N C I B L E ! ! ! There are in and there are outs…. This one is an in!!! Love that Mark. My favourite episode! 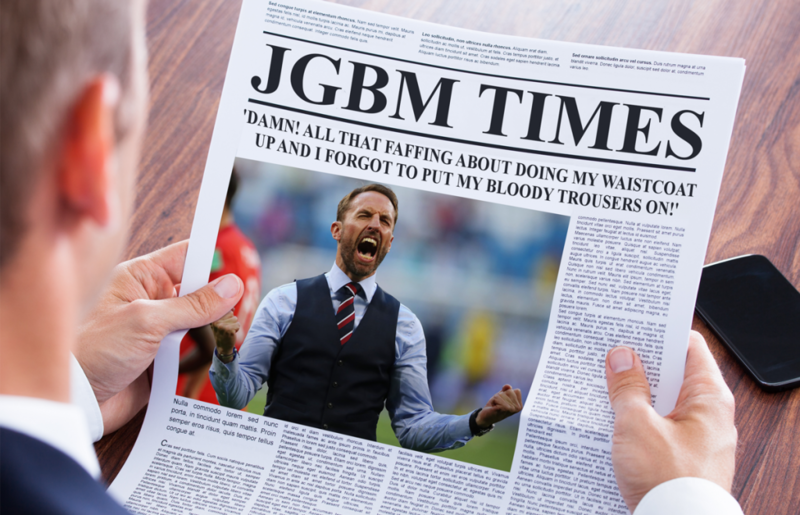 Southgate celebrates after hearing about the waistcoat clearance sale! « Our World Cup Caption Competition – Week 3!